It took five visits over a 12-day period and more than 12 hours of walking before I could say I had seen a Great Grey Shrike (155). I think I earned it. Apart from the Pectoral Sandpiper at Beddington that eluded me completely despite four hours of searching, no other bird has had me on the ropes as much as this one. 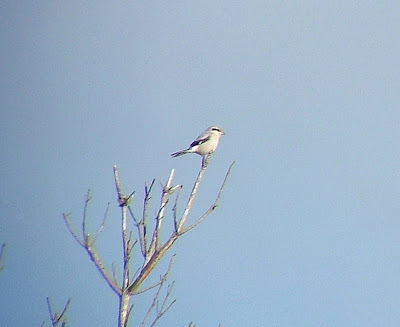 While numerous other people managed to see the Shrike at the first attempt, my experience had been like a baseball player. On the first three visits I had three strikes and was sent packing (didn't see it three times in a row), the fourth time I got a base hit (I saw it, but only really a glimpse), and then at the fifth attempt I got a home run (had a good view). Overall, I saw it four times. The first time was soon after arriving at the Common yesterday, when it flew out of a pine tree close to the boardwalk that leads to Pine Island. It flew off pursued by a flock of Meadow Pipits hell-bent on making its life a misery by mobbing it for all they were worth. It eventually flew into another pine tree on the walkway between the entrance of the Common and the island, but I lost sight of it. It didn't help that I managed to slip over in the mud and had to spend a good ten minutes cleaning my scope. 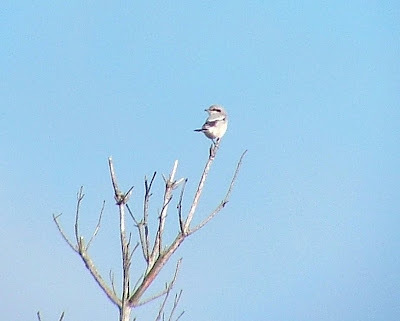 Luck was on hand, however, in the shape of Danny and Penny Boyd, who were the first people to see the Shrike all those days ago, and had seen it regularly ever since. My only hope was my presence hadn't put a curse on them after my poor recent record. While they headed for Shrike Hill, I walked further east to see if I could find it. 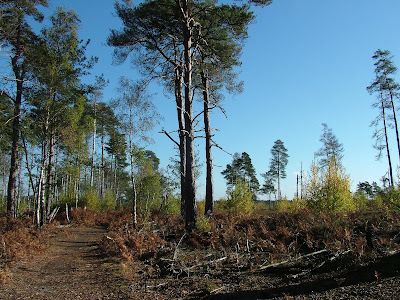 Drawing a blank, I headed back towards Shrike Hill through the island and on to the boardwalk. I could see the Boyds and their friends obviously viewing it through their bins, but I couldn't track where they were looking. Nothing for it, but to go and join them. The Shrike had been sitting on a wire not far from me, and if I had stayed where I was I would have had good views of it. Inevitably, it flew off just as I arrived to join the group, but it then perched on a small pine some 400 yards away. At last, I got my first proper view of a Great Grey Shrike perched on a branch, preening itself, albeit a long way off, on neighbouring Ockley Common. I could just make out its black Zorro-like mask, but at a distance it looked more like a big grey marshmallow stuck on a branch. After a couple of minutes or so, it flew off again and that was that. This Shrike is elusive and active and uses the whole of Thursley and Ockley Commons as its patch. It also appears to use Witley Common, on the other side of the A3, to roost, as the Boyds also saw a Great Grey Shrike there on Friday in the late afternoon - it was probably the same one. So, now at least I could relax. I'd seen it so I had a new tick for my Surrey list. I still wanted a decent view of it, and as the day was bright and sunny, I dragged my sorry carcass over to Thursley again this morning. These journeys were becoming a bit tedious, if I'm honest. I had thought about heading south instead to go and see the Rose-coloured Starling at Newhaven, plus the Pectoral Sandpiper at Arlington Reservoir and the Shorelark at Cuckmere Haven. I reckoned I could guarantee seeing at least one of them, whereas with the Shrike there was no such certainty. In the end, my restless urge to see the Shrike got the better of me. This time round, I first saw the Shrike over at Ockley Common having a brief altercation with a crow before disappearing again. I then hesitated - what to do. In the end I made the right choice and headed over to Ockley. That was where I had last seen it, so chances were it would still be there. To confirm my hunch, I noticed in the distance the two-pronged Great Grey Shrike homing device that is Danny and Penny Boyd clearly looking at it through their binoculars. They are an uncanny couple - they never fail to find it. My main fear was arriving too late. 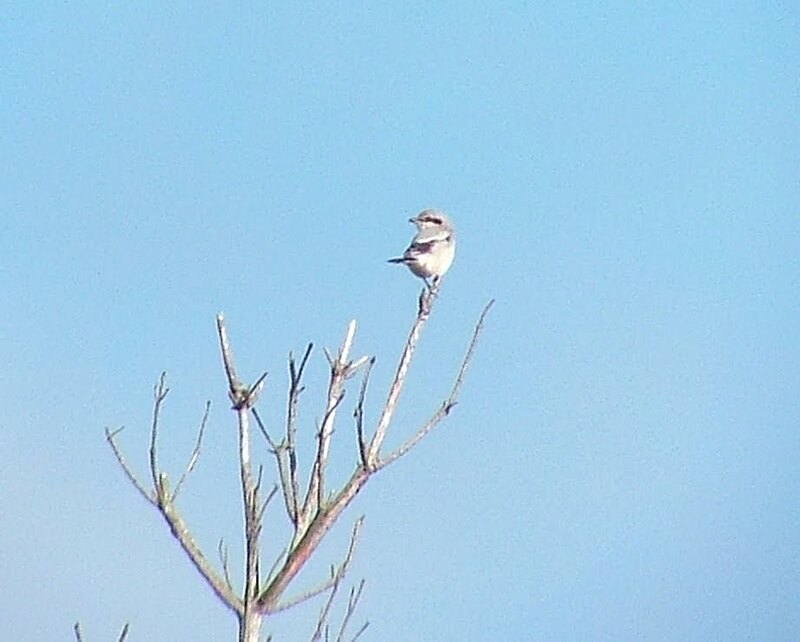 After a 15-minute walk through very boggy ground I at last came across the Shrike perched high on a dead tree. It stayed for a few minutes before flying off, heading south west towards Shrike Hill, occasionally hovering like a Kestrel, before swooping down and away into the distance. Job done. I can now focus on other birds I need to see, including some hopefully more straightforward species like Brambling. With all your efforts, a well-deserved tick. Still time for the Rosey, Pec Sand and Shorelark, all still present today (Sunday).